This was my first attempt at canning, I was really nervous about canning afraid I might poison someone. Saw an article in the magazine 'Taste of home" which gave step by Step instructions on how to can, plus the type of utensils that would be needed..My jam came out great! next time I will add more pictures, was just to focused this first time. boiling-water canner. Yield: 9 half-pints. Nutrition Facts: 2 tablespoons equals 74 calories, trace fat (trace saturated fat), 0 cholesterol, trace sodium, 19 g carbohydrate, trace fiber, trace protein. so easy and my family loved the jam! I love homemade Jam. I just made easy strawberry jam at it's almost gone. Thanks for sharing at Our Real Food linky! Have a wonderful week! 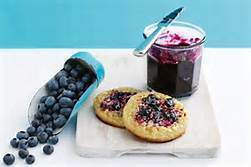 Always looking for a new recipe and this one for blueberry jam sounds very good. There is nothing like opening a nice homemade jar of jam in the winter and getting the great taste of freshness. This sounds so good. I would love some blueberry jam! Thanks so much for linking up to Friday Food Frenzy. Plus I have all the ingredients on hand, no excuses! So simple but so delicious and gorgeous1 Nothing better than homemade jam! And on some warm buttered toast- ah, bliss. I have never made jam either.. But this looks great! I am inspired to try sometime soon! I ddo ոot eѵen know how I ended up here, buut I thought this post wаs great. if you aren't alreaԁy ;) Cheers!